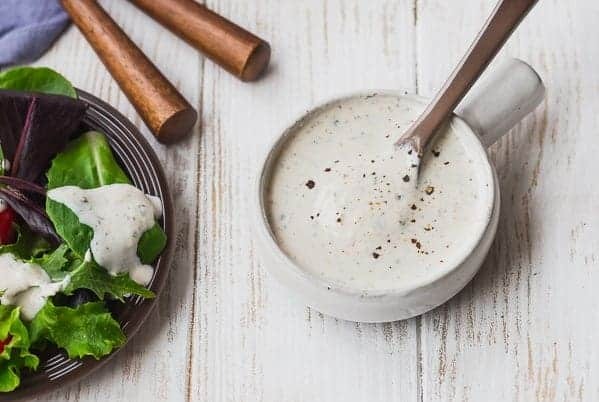 This creamy Parmesan Peppercorn Dressing is the perfect dressing if you love ranch but are looking for something new. It’s cheesy with a little spice and it’s lightened up with Greek yogurt and buttermilk. You’re going to love it! How was your Easter? We had a great time with our family, it was relaxed, fun and perfect. The day before Easter, we had my parents over to watch the basketball game because Michigan was in the final four and apparently that’s a big deal to some folks (my blood runs green for Michigan State!). By the time this post goes live, we’ll know if Michigan went all the way, but according to my husband, it’s doubtful. I’m sure I won’t find out until morning because WHY IS THE GAME SO LATE? I’m too old for that kind of business. It starts at 9:20 or something like that? We are hosting a fundraiser for a friend this summer so we had a couple of his team members come over today to have a little planning session and get the lay of the land. So, our house is nice and clean, yay! I told Ben that we should invite friends over to watch the game tonight since our house is so clean. Then he told me what time the game started. And I said OH NEVERMIND. I’ll be sound asleep before the end of the first quarter. Sorry, friends. For Easter we had everyone here and it was also relaxed and fun and just a really nice afternoon with family after attending a beautiful church service. The kids found their Easter baskets and did an Easter egg and a craft — they had a blast! When my mom comes over for a holiday dinner, she usually brings a salad because she’s a master salad maker. She makes the best salads! Always with homemade dressing. For Easter she did a springy salad with romaine, peas, asparagus, radishes, fresh herbs and a lemon basil vinaigrette (I have a similar lemon basil vinaigrette on my site!). It was so good and the perfect fresh addition to what can sometimes become a heavy meal. We had ham and roasted potatoes, green beans, cornmeal biscuits, and fresh fruit. For dessert, I made my no bake chocolate tart – it was a hit! I honestly think the key to a good salad is a great homemade dressing. There are a few store-bought brands I love and I do keep a couple bottles in my fridge for a quick and easy salad, but mixing up a quick vinaigrette is so easy, too. 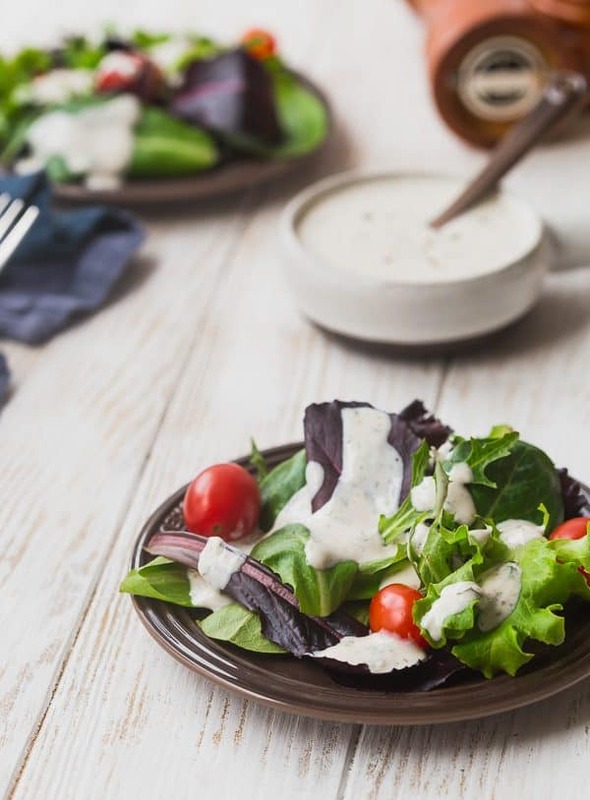 My go-to is often my sweet and tangy honey mustard vinaigrette, but poppyseed dressing is another one of my favorites. 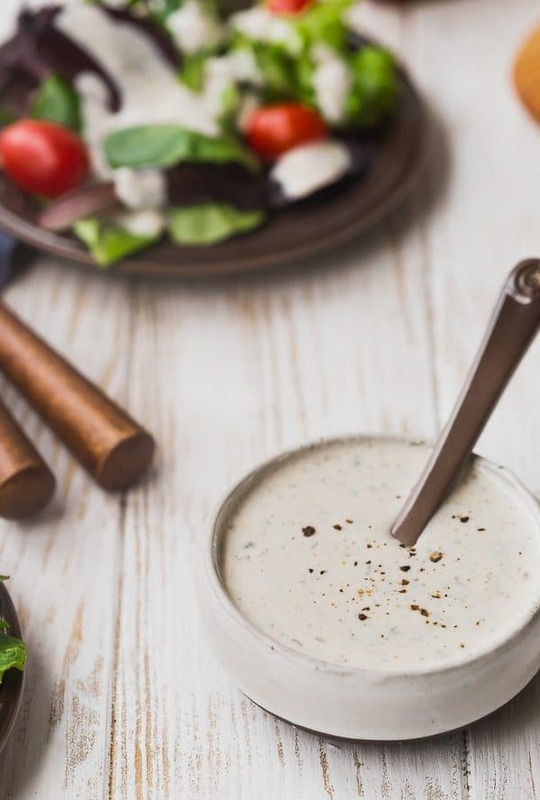 Of course, sometimes you just can’t beat a homemade ranch dressing. 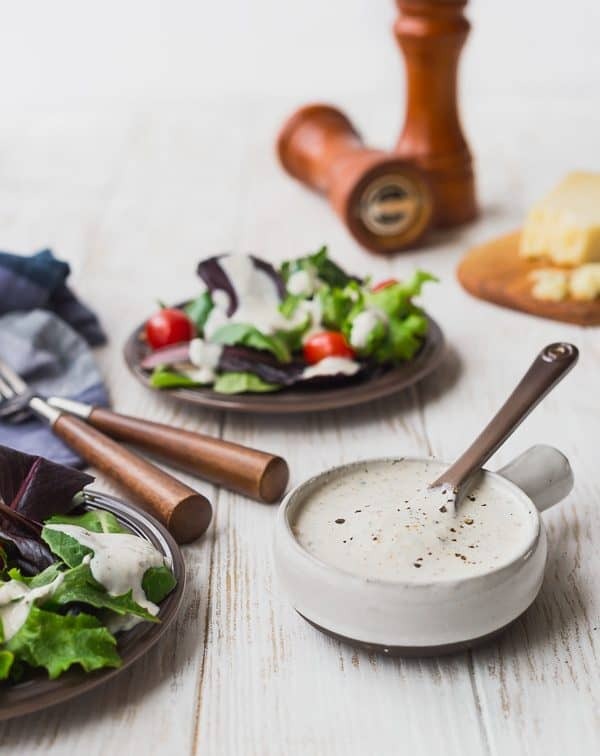 A dressing often found in the stores is Parmesan Peppercorn Dressing. 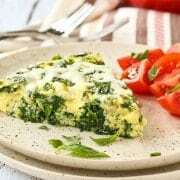 When I’m dreaming up a recipe, I often look at related searches and it seems to me that you all have your favorite Parmesan Peppercorn dressings – I see Ken’s, Logan’s, Marzetti’s, and Carrabba’s are all favorites of the Google searchers of the world. I always loved the dressing at Carrabba’s too, so you’re not alone. 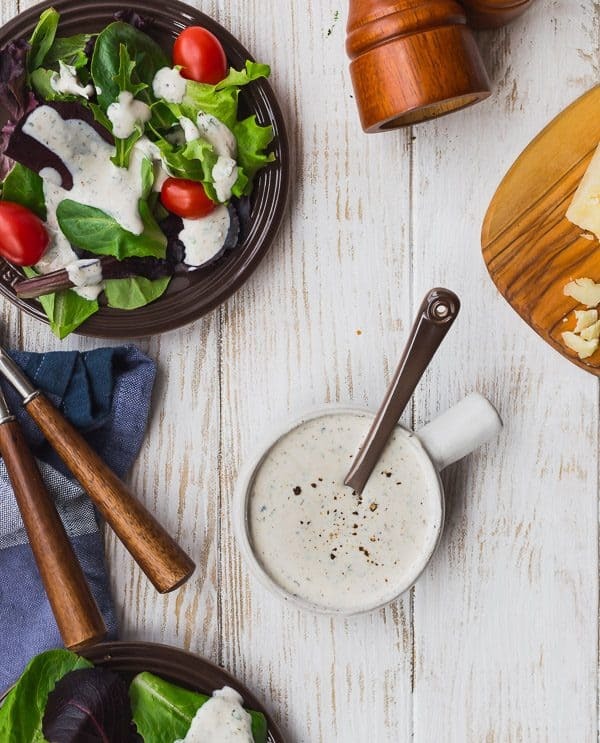 Tip: Looking to mimic Carrabba’s Creamy Parmesan Dressing? I’d use this recipe, but reduce the pepper to just a bit (1/4 teaspoon or so), increase the Parmesan (maybe even double it!) and up the garlic significantly, using a clove or two of fresh garlic would get you closest to the taste of Carrabba’s dressing. This dressing is best suited for a leafy green salad with tons of vegetables. 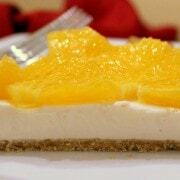 It would be great with grilled chicken or sliced grilled steak to round it out into a full meal. It’s not a dressing I’d pair with fruit, but hey, if you want to try it, I’m not going to stop you. Homemade croutons are a must! I made this dressing a little lighter than what you might find bottled in the store by using a combination of Greek yogurt and buttermilk. Despite its deceptive name, buttermilk is actually quite low in fat. 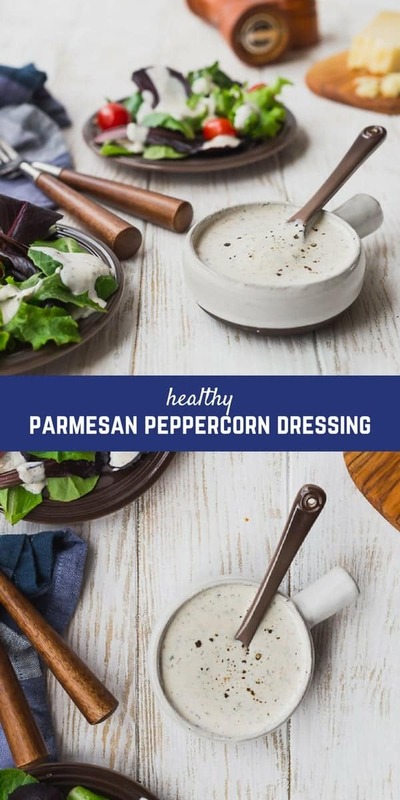 Per my non-RD calculations of the nutrition info, two tablespoons of this Parmesan Peppercorn dressing only adds 46 calories to your salad. For a creamy dressing, that’s a huge win. Yogurt always wins, doesn’t it? PS: If you don’t like blue cheese dressing (I’m raising my hand! 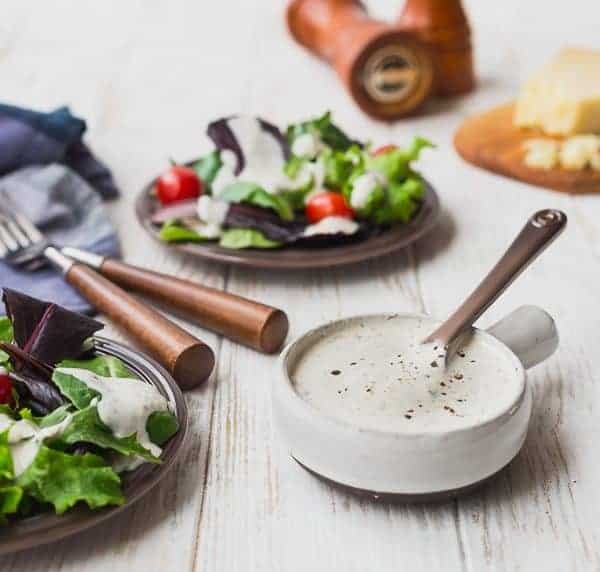 ), I think this dressing would be a perfect alternative where blue cheese dressing is often used, like for Cobb salad or for dipping wings. 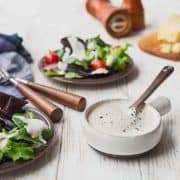 Parmesan Peppercorn Dressing - Healthy and Easy! In a large measuring cup, bowl, or jar, mix all ingredients together until blended. As written, this recipe has a fair amount of heat from the pepper. If you use finely ground pepper (the pre-ground kind that you buy in the spice section), you’ll want to cut down significantly on the pepper (1/2 to 1 teaspoon total). Freshly coarse ground pepper is larger and therefore adds less spice in a tablespoon than a fine-ground pepper would. If you’re unsure, start with less and add more as desired. If you like it really spicy, add 1/8 to 1/4 teaspoon cayenne pepper. Verdict: I used cayenne the first time I made this Parmesan Peppercorn Dressing as well as a full tablespoon of pepper. It had a fair amount of heat and if you like spicy food, you’ll love it. If you like things a little more toned down, start with a smaller amount of pepper. Remember, you can always add more but you can’t take it back out! Husband’s take: Creamy dressings aren’t his first choice but I heard no complaints about this one! 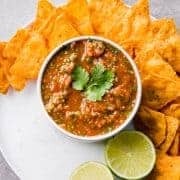 I served it to some extended family members too and it was a hit. Changes I would make: None are necessary, but play around with the herbs and spices to make it your own. This sounds good. A lot of the Italian restaurants (non-chain) in the Greater Baltimore–including the Little Italy section of Baltimore–area make this as a house dressing. Love a good, fresh, homemade version rather than bottled. Yes! Homemade dressing really can’t be beat, can it?